Wesley Homes celebrates 70 years of serving seniors and the greater Puget Sound region. 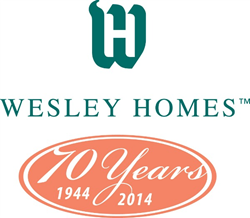 Wesley Homes Retirement Communities and Home Health Services marks its 70th anniversary with their Annual Open House on Sunday, September 7, 2014, from 1:00 p.m. to 4:00 p.m. For more information or to RSVP, call 855-445-8827 toll free. The celebration includes hors d’oeuvres prepared by the Wesley Homes culinary team led by Executive Chef Chuck Chalfant, live music, dancing, helpful resources, chair massages, self-guided tours of the campus and amenities, blood pressure checks by Wesley Homes Home Health, opportunities to visit with residents and drawings for prizes, including a chance to win a Clipper Vacation or dine at Mama Stortini’s. Those who RSVP will be entered into a special drawing to win a gift certificate to Anthony’s Homeport Restaurant. Live entertainment will be provided by JB Music and Uptown Lowdown Jazz. Guests will be treated to a classic car showcase and rarely seen photos from Wesley Homes’ history. Community partners - Just Like Daughters, Pier View Chiropractic, Real Estate 65+ and SASH (Sell A Senior's Home) - will share helpful information on downsizing, real estate, move coordination and health services. Located on the Wesley Homes Des Moines campus, Elder and Adult Day Services (EADS) will also welcome visitors. Wesley Homes - originally Wesley Gardens - was established in 1944 from the dream of Rev. Dr. Stanley Logan and the community of Methodists around him who saw a need for an alternate, communal way of living for older adults. His belief in building a community around a common faith of care and dignified support for each other was the premise that Wesley Homes continues to build on today. Originally a blueberry farm, Wesley Gardens has grown into Wesley Homes, which includes Wesley Homes Des Moines, Wesley Homes Lea Hill in Auburn and Wesley Homes Home Health. In September, Wesley Homes breaks ground on a health and rehabilitation center on the Auburn campus. With land in Puyallup and Renton, plans are in the works to continue to build additional communities to meet the needs of older adults in the Puget Sound area. Wesley Homes is a not-for-profit organization that provides a network of services offering a continuum of care for older adults with two retirement communities in south King County, a private pay home care agency and a Medicare-certified home health agency. It is affiliated with the Pacific Northwest Annual Conference of the United Methodist Church.